FELT is a project that was developed from a study which sought to understand what emotions were communicated to people through different textured textiles using just vision alone and then vision and touch. 5 different textured textiles were designed for this study which referenced animal reactions to different stimuli such as anger, fear etc. These textiles could move into different states which from flat to hair-raised for example and the speeds of the reactions were calibrated to imitate the speed of responses of the relevant animal after which the texture was modeled. FELT uses the results of that textile and emotion study to create a wall panel that engages the sensuality of touch with vision but also uses the wall to communicate an emotion back to people who interact with it. FELT communicates emotions to people and through vision and touch and transforms according to their responses. FELT is a large wall panel in progress now. In the photographs are two different test samples which were considered for the wall panel. The top two photos show the front and back side of a sample that has highly conductive yarns where the circuit of the conductive yarn is knitted into the textile iteself. 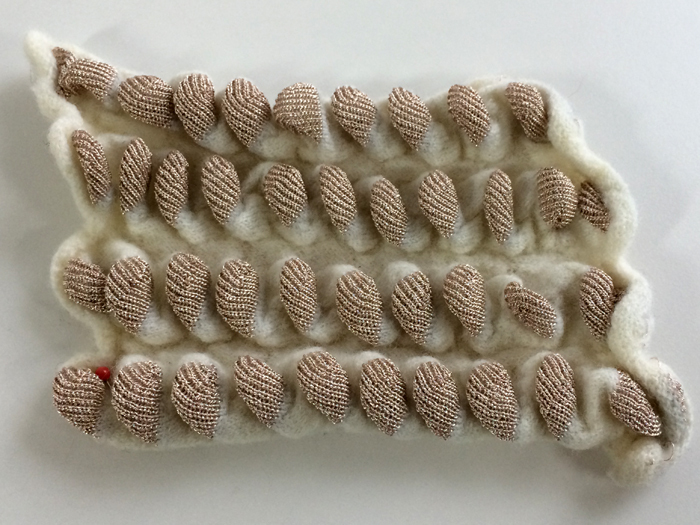 This specific sample is made with a fine white wool yarn and stainless steel and copper coated polyester yarn. The piece was then felted to get density and stiffer texture. This conductive yarn permits the textile to work well as a capacitive sensor.